Episode 12 - Who is the Culprit? Episode 31 - To Town to Shop! Episode 36 - It's Hard to be a Teacher! Episode 41 - Who is the Person with Pointed Eyes? Episode 44 - The Gang of Theives called "Sweet Natto"
Episode 45 - The Chase after Yamada-sensei! Episode 46 - Shinbei's Papa is Coming! Episode 67 - A Famous Item "Nintama-zuke"
Episode 79 - Hizeniya Orin is Captured! Episode 87 - Don't Make Footsteps! Episode 103 - Let's Investiage Ninjutsu Gakuen! 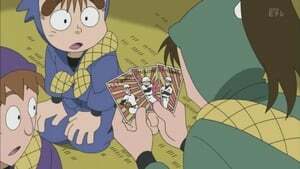 Episode 106 - Hurry up, Nintama! Episode 113 - Takiyashamaru is Captured! Episode 114 - Let's Go Save Takiyashamaru! Episode 117 - A Beautiful Friendship? Episode 120 - Get Up Early and Get 3?